Volunteer brought 6 bottles of wine: a 2011 Crios Torrontes; a 2011 Reserve de Cleons Loire Valley muscadet; a 2011 La Manoir Sancerre; a 2009 Sea Ridge California Sauvignon Blanc; a 2009 Sea Ridge California Merlot; and a 2007 La Czar Chardonnay. I think a bottle or two got added to our cellar…but who knows? Congratulations to Jerry and Tina on their anniversary. We also acknowledge Don’ his sebentylebenth birthday. Nancy will soon be old enough to be a legal member of the Wine Club. Nancy reported that the last 275 toys were delivered last week. Congratulations on another successful Care’n’Share toy drive. Don’t forget about the District Conference on the 4th of August in a tent at the San Dieguito campus of Miracosta College on Manchester. The focus will be on fund-raising and membership. Power Hour starts in earnest next week. Be at the Rock Bottom no later than 12. We’ll eat, and then our speaker will take the floor at 12:30. The meeting will be over by 1:00. 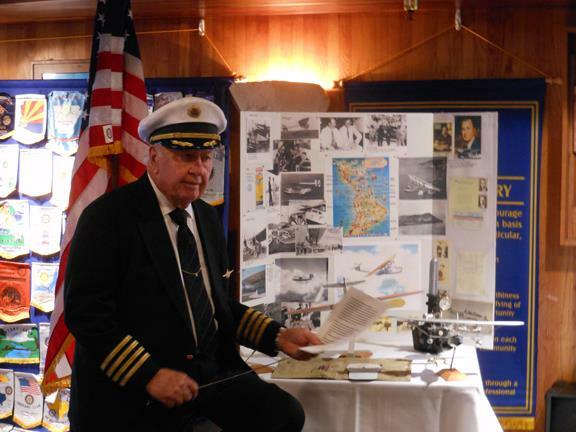 Our speaker was Tommy Carroll, who flew for Pan Am from 1955 to 1986. He talked about the China Clipper, the first plane to cross the Pacific. We’ve come a long way since the thirties, when the plane made 3 stops to fly from San Francisco to Manila at 145 miles per hour. Now, we fly non-stop, and in spite of airport security, we still get there a little faster.